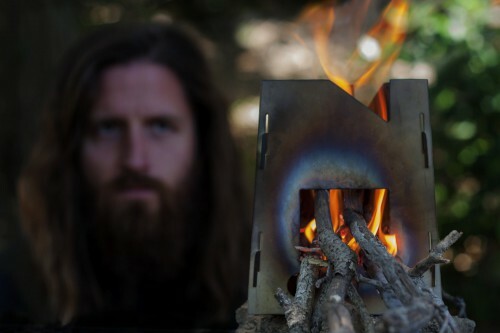 The PaleoStove is the minimalist’s camping stove. It combines a simple and modern design with high functionality. The design is based on high-efficiency cooking stoves distributed in developing countries, helping to save lives and reduce deforestation. When collapsed, the 3-piece design fits in a greeting card envelope with the thickness of only a nickel. The PaleoStove burns wood, not fossil fuel or chemicals, so you do not need to purchase and carry fuel tanks. You merely collect, burn, and recycle the wood that you find on the trail. By burning wood, the PaleoStove does not contribute to global warming. Scavenged sticks are fed into the stove, so no wood chopping is required. The PaleoStove’s design allows you to use large sticks of wood. Even damp wood can be used. This is the stove that cavemen dreamed of.